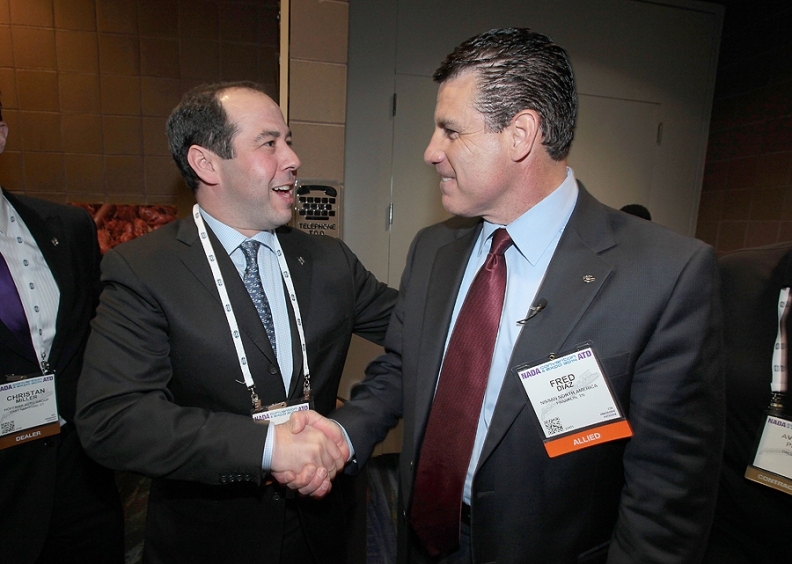 Nissan's Fred Diaz, right, greets Matthew Hoffman, vice president, Hoffman Auto Group, a multi-franchise group in Connecticut, moments before the Nissan make meeting Saturday. NEW ORLEANS -- Nissan told dealers at its make meeting that it has made last-minute changes to a new U.S. sales growth plan that enlists retailers to boost their individual store sales volumes. The company will take a state-by-state approach to raising Nissan market share across the country, Fred Diaz, Nissan senior vice president for U.S. sales, marketing, parts and service, told dealers at the meeting. Nissan is out to garner a 10 percent market share in the United States by the end of its 2016 fiscal year, up from 7.3 percent at the end of 2013. The automaker wants all dealers to raise their local market shares and hopes to incentivize dealers with stair-step sales programs to get there. The tweak acknowledges that dealers in some challenging markets, including Midwestern states, may have a tougher time hitting the same targets as dealers in regions such as Texas and California, where Nissan is already close to 10 percent, said Brad Fenton, national dealer advisory board chairman. Dealers at the meeting also heard Jose Munoz, chairman of the automaker's North American operations, promise more Rogues and more electric Leafs in response to requests from retailers. "One of the big messages from us here was 'I want more Rogues; I want more Rogues,'" said Fenton, who owns six Nissan stores in Oklahoma and Missouri. "And Jose told us we'll get them." Munoz said Nissan has been watching sales results of the recently launched Rogue to see whether the market wanted the higher-end version of the crossover. "The most important thing for us was that we position the product right because we increased the price versus the former model by around $1,500," Munoz said after the meeting. "All the feedback we hear is that the highest version is the one that's selling best, which will help us reduce incentives and increase profits. The demand is there." Munoz said Nissan has not yet determined how many additional Rogues it can get into the production schedule. He also revealed that Nissan will take production of the Leaf to more than 3,000 a month this year, up from about 2,000 currently. Munoz said the production increase will be accompanied by new Leaf advertising. After emphasizing the need for confidentiality, Nissan showed dealers at the meeting a photograph of its next-generation full-sized Titan pickup, which is expected in showrooms in 2015 and has been a recurring subject of dealer questions. Munoz told the group that dealership profitability for the franchise rose 19 percent in 2013 and return on sales rose 12 percent.